$100.00 for First Hiker. Park City Museum admission included. Before Park City was known as the largest ski destination in the United States that it is today, it was a thriving silver mining community. Our local guides will show you some of the exciting history of the area while you stretch your legs and breathe in the fresh mountain air. Depending on how long you want to hike and how much uphill you want to tackle, your guide will create a historic hiking tour just for you. You may get to see old mine buildings or entrances to mining tunnels when you choose from one of three levels of tours below. 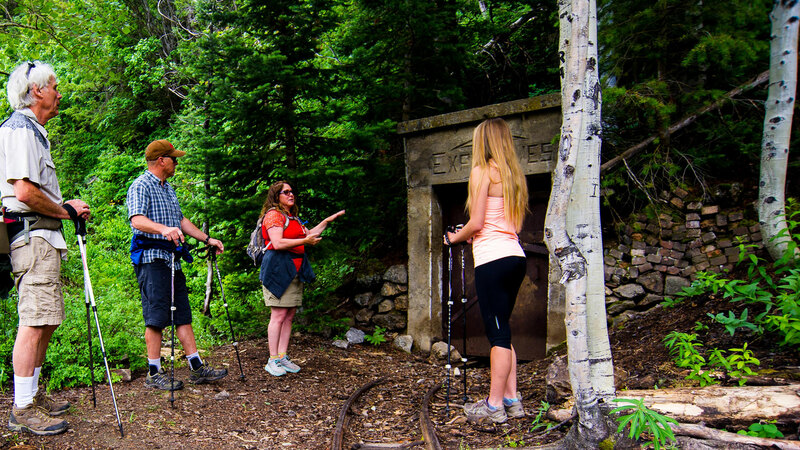 A flat and mostly downhill hike that lasts 2 – 3 hours and traverses trails in the Silver Lake or Empire areas of Deer Valley. A three-hour intermediate hike, through Daly Canyon that ends at the Silver King mine. Starting at the Spiro Mine and lasting four-to-five hours, this tour is mostly uphill for the first half before becoming a downhill hike for the remainder. $100 for first hiker; $75 per additional hiker. Park City Museum admission included.